It is time to pull the plug on plug-ins and bury the browser. Highlighting the strengths and weaknesses of some of the software projects that will replace the World Wide Web, email, and chat. The freedom to be yourself, to express who you are, freely using the results of group efforts, and of other individuals' works, but recomposing them into artistic, scientific, religious, and philosophic works that don't force you to compromise what you believe (and allow you to combine all these disciplines). And you will get paid fairly for your work, as well as all those you quote, and whose work you borrow from. It will be groups working together, but without imposing group-think mentality upon anyone, as each person can individually publish and benefit from their own edition of any final products. But no document will be truly final, because it can always be corrected and improved upon by the author, and then modified and republished by other writers. The original author can then use the improvements added by collaborators in another version. Everyone gets credit for their work, gets paid, borrows freely, speaks freely, and works together while maintaining individuality. If you wish, you can even promote (or not) products, services, and artistic works you appreciate without being forced to lie about their weaknesses by your sponsors, since you will get paid for your evaluation by those who listen to and view and value your opinion. You can work with others to produce services that combine news, entertainment, and education without editorial quality being compromised by financial considerations from controlling forces bigger than you. These are the goals of Xanadu that are not possible with the tools we have today. These documents present and link to the methods and tools needed to accomplish these goals. Because no two people have ever lived the same life. A tool worthy of chronicaling and creating the achievements, documents, and discussions * of all mankind ( * scientific, political, artistic, literary, mathematical, personal, social, religious, etc.). A many lensed camera with many microphones and reels of film, cloned and spliced, being created, edited, and viewed by many people, with the Universe and its' inhabitants as stage and actors; semi-chaotic but being continuously reorganized. Adding useless complication, gimcracks and geegaws to keep you distracted from what really matters: worthwhile content and highly interconnected relationships as you and others see them. *gimcrack: adjective - flimsy or poorly made but deceptively attractive: plastic gimcrack cookware. noun - a cheap and showy ornament; a knickknack. *geegaw: noun - a showy thing, esp. one that is useless or worthless. See The Future of Information for a fuller expounding of these thoughts. Also see - If Xanadu and Mirror Worlds are the answers, what are the questions? 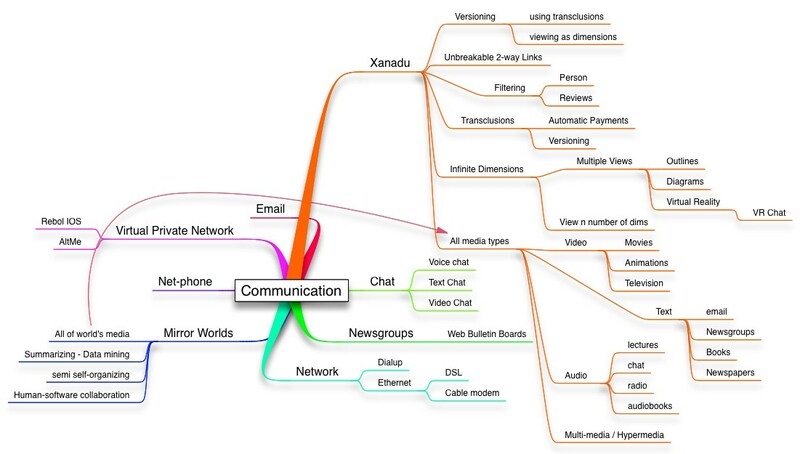 Xanadu will provide all of these capabilities. Facilitate the modeling of thought and reality with software. The reality of all that exists, has existed, and might exist in the future; it's meaning, interpretation, and interconnections - these are the objects and concepts to focus on. These should influence the data structures, not the other way around. We need to go beyond the mere imitation of paper in our software design. Everything Must be editable, quotable, annotatable - all the time by everyone. This is not optional. It must, however, be clear what has been modified, and who made the revisions. The same information can be structured-viewed-formatted in various ways. Simultaneously having multiple dimensions and views. Potentially infinite dimensions will allow the same data to be included in vast numbers of sets, lists, and structures. Each user can have many unique personal dimensions linking all the documents they have ever accessed. They will be able to view these dimensions on any Internet connected computer, thus in effect, allowing their complete personal computing environments to follow them to any available screen in the world. By following along their personal time dimension from past through future, it provides a simple chronological organizing structure. You could even have a dimension linking all your favorite dimensions created by others. The real world will be one of the transparent overlays, it will be that other reality. It will be the strongly predominant display in mission critical situations, such as driving and close encounters with loved ones. Transclusion - (cloning, see-thru links). These allow quoting anything without losing the connection to the original document. This refers to a compound document where the viewer sees what appears to be a single work, but is in fact seeing parts of several works. This is not cut and pasted together, but seeing parts of several "pages", as if they were stacked transparent overlays. Easy royalty payments. Necessary if you want all the world's libraries and copyrighted media to potentially be available everywhere. Transclusions facilitate this. All versions accessible, comparable side-by-side, with changes, deletions, and additions made visible between any two or more versions. Persistent, unbreakable 2-way links. This means that renaming files and directories and changing servers will have no effect on links and addresses. Links can be to and from points, spans (sentences, phrases, chapters, video segments, etc. ), and documents. There will also be many author and reader defineable link types: comment, addition, disagreement, correction, outlines, and versions. A permanent data store. This makes it all possible. Everything gets an unchangeable storage location (automatically encrypted and backed-up in several locations). All documents, versions, and transclusions refer to this for content. "No one ever takes a photograph of something they want to forget" - from the movie - One Hour Photo. Mirror Worlds will provide some of the above capabilities and the following as well. Data mining. Seek insight into the nature of vast quantities of information by finding patterns in it. Automatic summarizing of huge amounts of information. When universal broadband connections make possible millions of fire-hoses of information all feeding into the Internet, a powerful method of making sense of it will be needed. This will probably be most useful in analyzing types of information that can be expressed as statistical data; and in diagnostic uses and monitoring current conditions of complex systems. A zoom-able interface, where you gain a system-wide view of the structure of the world or part of it, and can see all the parts in the context of the whole. Then you can zoom in anywhere for more detail. Seamlessly integrate the analytical and creative capabilities of people and software. Integrate the storage and processing capabilities of millions of computers by combining them into a virtual supercomputer. If you need more processing power, your program spawns more programs on any connected computer and returns the results to you. I expect the future of software to include some combination or merging of these; or a new data structure that will offer the benefits of both. Perhaps the ideas behind Mirror Worlds can be used to build a distributed archival system for Xanadu; as well as distributed processing, similar to that used in the Folding At Home Project. What is wrong with the World Wide Web? It violates or lacks all of the above principles. Links break when web pages move. Links are one-way (when you link to something, it doesn't link back to you. It is difficult or impossible to add your own notes and comments to the content you are accessing. The lack of transclusions makes royalty payments and copyright protection very difficult, thus excluding tens of millions of valuable documents from being on the web, despite the web's enormous efficiencies of distribution. Previous and alternate versions are almost never available. It is a mishmash of technologies that are virtually impossible for one person to learn. Most software today is like frosting with no cake underneath. The frosting looks and tastes good (is user-friendly), but without a solid structure underneath, it collapses. It lacks a structure that is strong, yet flexible. (In Xanadu, the back-end server software is the cake, the front-end client, always editable, is the frosting). The Web is the most popular form of hypertext, but one of the worst. The fact that this is a website pointing this out highlights it's greatest strengths. It was the first hypertext to use the Internet and it is cross-platform. But it will not last. It does not have strong and flexible structure. It is a towering house of cards held up by hype and short-sighted expediency. It is collapsing. Current software isn't totally worthless. Some of the best could become part of the front-end software for creatively interacting with the contents of a persistent data* store. Monthly subscriptions could be re-distributed proportionally to some of the content providers: writers, painters, animators, movie-makers, commentators, programmers, singers, musicians, translators, narrators, etc. * The words data, content, hypertext and hypermedia are often used interchangeably and include all forms of communication; including newspapers, television, radio, magazines, books, movies, virtual (realities, 3-D artistic creations, mathematical, geometrical, fractal, and topological universes in infinite dimensions, land-sea-planet-space scapes and travel, shared chat spaces where each participant can choose their environment and activity). These "documents" can be a new shared artistic medium: swimming, flying, dreaming, and imagining together. All made possible by a flexible and scalable data structure. My belief is that there will be VR environments where each person engaged in a conversation can at the same time be in the location and activity of their own choosing: spelunking, sitting on a beach or in a tree in a rain forest, bungee jumping, spinning a pottery wheel, exploring the Marianas Trench, or merely shopping. While watching a movie, you could add your own audio commentary or textual notes and links as a supplement. Someone watching the movie could have the option to listen or read your additions. When they do this, micropayments would automatically be deposited into your account and the movie maker would also receive royalties from each viewer. The same thing for all media: books, magazines, newspapers, radio and television programs, music. You could create a composite document of any or all these media, freely using everything available. When viewed or listened to, all the content creators would receive payments automatically, unless they want to give their content away. Our tools become extensions of ourselves. That's why we can develop such a personal attachment to them. Here's how I think about what we need developed in software: When I am engaging in any form of human communication, (day)dreaming, or other sensory interaction, I think about how it could be done even better with software and hardware. I may be watching a movie in a theater or DVD, listening to a live orchestra, watching the news on TV, hiking in the woods, reading a math book, talking on the phone, whatever I may be doing. How could I record, share, link, annotate, enhance this experience? How can it be improved? What am I missing because of current design limitations? When I think of a movie, I think of one that is visually, aurally, and intellectually complex, but with some unifying structure (Lord of the Rings, for example). When I think about linking, I think of each word linked to dictionaries, thesauri, and encyclopedias; each footnote linked to the location in the book referred to; each reference to a work of music or video linked to the actual work. And of course, everything must be editable all the time by anyone (creating a new version). In other words, when I think of hypertext, the one thing I don't think of is the World Wide Web (except to think of limitations to overcome). How can you know if what you believe is the best of all possible alternatives if you haven't read the best presentations available of all the alternatives? When responding to any argument (for or against something), you will be able to comment on each and every relevant sentence. The document you are commenting on will automatically link to your analysis. Whether readers of the document see your comments or not is up to them. They will have filtering tools to include or exclude whoever they want. That is their decision to make. Thus every possible viewpoint can be heard and can cross-comment on each other as much as desired. Ted Nelson - a pioneer in hypertext and designer of Xanadu, Zigzag, and Floating World. I recommend reading everything he has written. To design the new structures of writing for screens is a profound issue of literary structure. It is important to provide the best literary structure that we can, for hypertext, as the literature of tomorrow, determines in part the new structure of civilization. Civilization is in large part about, and around, what is written. This is what we call literature. Literature is an endless river, connected, like water, in all directions. Document connections go forward and backward in time, and sideways between documents. Scholarship and fiction, political speeches and criticism, advertising, journalism and technical reports-- all affect each other and evolve in a constant flow of ideas and writings. It is in jfax format. The files can be renamed with the ".tif" extension. If you are on a Mac, the jfax files can also be opened using Graphic Converter. Intertwingularity: When Ideas Collide - Ted Nelson's 70th Birthday Lecture. INDIRECT DOCUMENTS AT LAST! Now for a Humanist Computer Agenda. - Ted at his wittiest and wisest. A must read! Structure, Tradition and Possibility A concise explanation of the most important issues in software design. Not edited yet (has many spelling and grammatical errors), but explains many of the problems with the web. Xanalogical Structure, Needed Now More than Ever: Parallel Documents, Deep Links to Content, Deep Versioning and Deep Re-Use. And another version of this. Computer Lib/Dream Machines - a pioneering book in the personal computing field. Now out of print, so it is a collector's item. Video interviews These crashed my Safari browser, but worked with Opera. The audio only is also available This website has much other good information, but I had many technical problems accessing it. The Open Society and its Media Excellent coverage of the goals of Xanadu. Freedom of Speech in Software - The evils of software patents. How To Write Parallel Programs: A First Course Could this be the way to create a virtual super-computer on the Internet to serve Xanadu and Zigzag? Linda User's Guide & Reference Manual Download a demo of Intel-Linux software and a PDF manual (159 pages). Post Academic Manifesto by the author of token word. How to Deconstruct Almost Anything--My Postmodern Adventure A screamingly funny deconstruction of deconstructionism. Hypertext and Critical Discussion - A concise summary and links about what kind of hypertext is needed. An excellent dissertation "Xanadu: a proposed solution to the problem of information retrieval on the World Wide Web"
Xanadu Algorithms and description of a proposed movie to show what it will be like. Example structure of a mindmap about philosophy and religion, showing how a lot of subjects might be linked from one person's viewpoint. How versions and formats work in Xanadu (a simplified explanation). Two Key Elements - my first "Podcast"
If Xanadu and Mirror Worlds are the answers, what are the questions? Principles to keep in mind when designing software. The OS and Software of the Future Imagine an operating system that allowed unlimited linking between any files or parts of files, renaming and reorganizing the files with no broken links, no restrictions on file naming, multiple names for the same file, the same document (or part of one) can be in many places at the same time, every word in every file is constantly indexed (including spoken and sung words). Viruses are a distant memory. The limits of our imaginations will be the limits of our software. The New Amiga I wrote this before I used Mac OSX, Windows XP and 2000, so some things have improved since then. I explain some of my likes and dislikes of various operating systems over the years. Bad Software Hurts People - Some of my nightmare experiences with horrible business software. Arcoscenario How advanced hypertext could help design new cities. What would a Floating World chat look like? TokenReb A proposed prototype to demonstrate some of the Xanadu features. The Ingenuity Gap book. I haven't read it yet, but the first chapter and other material is online. Collaboration System Some excellent writing on open hyperdocument systems, summarizing Doug Englebart's goal. Automatic Hypertext is an interesting article about making every word have multiple links. This is how all hypertext should be. There are also many other good articles and links at LiquidInformation. The Tyranny of Copyright Although it doesn't mention Xanadu as a solution, it is a good outline of some the problems. Costs $2.95 to read. The Loaf Question "This is the data structure created for the Xanadu? project between 1988 and 1992, and may be the most complex data structure in the world. At the very least, it's fiendishly hard to comprehend by reading the literature and the code. Hence the pictures." "It was designed to hold all the knowledge in the world. You tell it secrets, and they are dutifully stored away in an ever-branching, walking tree of long memory. It knows everything it's ever been told. It knows who told it. And if you change your mind, it remembers both the new secret, and the old, and what parts of the new secret were taken from the old. It remembers if you've combined two or more secrets. It can tell you what secrets contain other secrets, even secrets that have since been changed. It knows what secrets simply refer to other secrets. It knows every revision of everything it's ever been told to remember." I have only a vague understanding of the structure of this design. Maybe someone will get Xanadu fully implemented this way. Time will eventually tell. All software developers need to learn about xanalogical data storage, as all software needs to be written in the future with the basic capabilities described here. token_word - created by Jason Rohrer in just 9 days of Perl coding - Pay attention to this, as it is the pre-curser to getting the tens of millions of copyrighted works onto the Internet, in a way where everyone gets fair payment, even when quoted and re-quoted. Implements some of the major features of Xanadu in a web browser (amazingly), including transclusions and micro-payment royalties. Just try it out. I was stunned. If you want to read about it first, see http://hypertext.sf.net/token_word/token_word.pdf Although not as graphically fancy as the Web (yet), it has the most important elements needed to replace the World Wide Web as we know it now. If you sign up for an account, you get 50,000 demo tokens free, to purchase that many characters of text. You can later buy more tokens at 1 million for a dollar using PayPal. When you read someone's document, tokens are transferred from your account to the author's. When someone reads your document, you get paid in tokens. If someone quotes your document, you get paid every time someone reads your words. The non-demo tokens have cash value. Finally, after 40 years of waiting, a working subset of xanalogical hypertext. Although the ultimate Xanadu will need to do more than current browsers can support, token word is the best proof yet that the main elements do work. A full-blown graphical version of Xanadu with visual editing and comparison of versions is bound to be just around the corner. I have posted many of the things on this website on token_word, so it is an excellent way to comment on them, or create your own improved version. Zigzag - infinite dimensional hypertext invented by Ted Nelson. Also see http://xanadu.com/zigzag and http://xanadu.com/zigzag/ZZdnld for the latest info and downloads (includes a very nice Flash demo and a Quicktime movie demonstrating it). Apple's Front Row looks similar to zigzag, but is only two dimensional. gzz - a visually stunning implementation of Zigzag. Has been abandoned and a new project started to replace it called fenfire. fenfire - A project to keep your eye on. Abora - a partial, but impressive, demonstration of Xanadu capabilities. Runs on Windows only. CosmicBook shows what it is like to use windows floating with visible links. Runs on Windows only. Xanadu Cyberarcheology Project Jeff Rush's wiki documenting Xanadu. Omnisio is a video compilation web application that allows adding notes to videos anywhere on the screen anytime during the movie. PakNet is a major new effort at implementing xanalogical hypertext. I look very promising. Sophie A project using Squeek Smalltalk to implement some of the features of Xanadu for publishing. Sentences is a very interesting database system with several ideas in common with Xanadu and zigzag. They have an excellent book about data modeling you can download called "The Associative Model of Data". Here is an excerpt from pages 70-71: "What makes a good application? Well, first, what do we mean by "good"? The answer is twofold: firstly, a good application must fulfil its users' needs now, and secondly it must be capable of adapting so that it continues to fulfil those needs as they change over time. 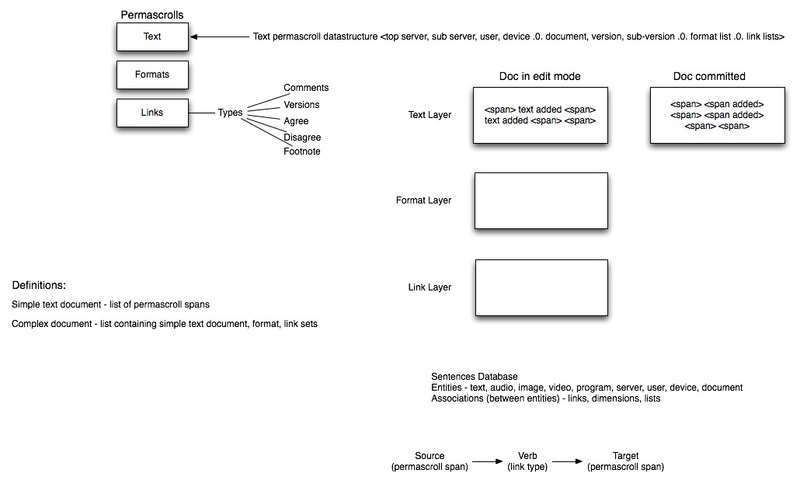 Conceptually an application comprises two parts: a data model and a user interface. Broadly, the user interface determines how well the application meets its users' needs now, and the data model determines how well it can adapt over time. It is now generally acknowledged that the lion's share of software development budgets are spent on maintenance rather than new development, so from an economic standpoint the ability to adapt over time (or more fully stated, the ability to be maintained at reasonable cost) is clearly the more important criterion. Thus the data model is more important than the user interface in determining the quality of an application. An application with a good data model and a poor user interface is not necessarily a good application, but an application with a poor data model can never be a good application. A good data model with a poor user interface is preferable to a poor data model with a good user interface, because it is relatively easy to fix a poor user interface and almost impossible to fix a poor data model." Compendium A very useful and free mind-mapping program with transclusions. For Windows, Mac, and Linux. 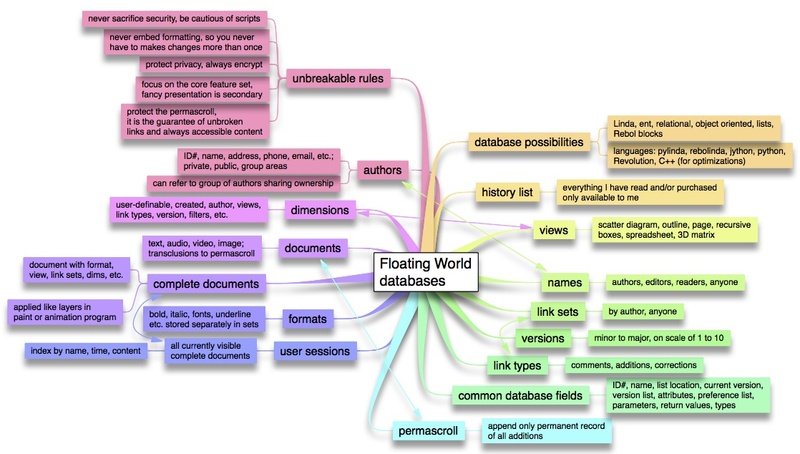 CMap Collaborative, cross-platform, and free mind-mapping program. 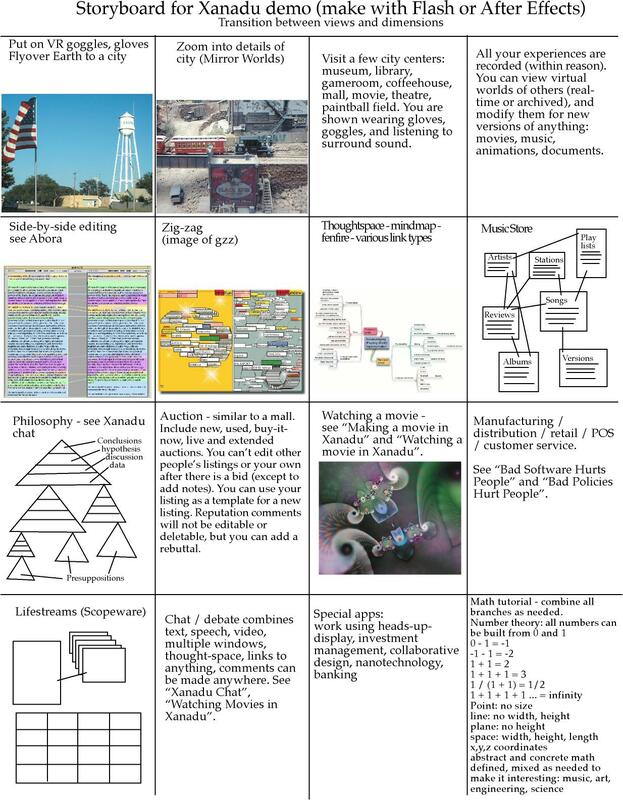 TruthMapping is a web-based highly structured forum for logical argumentation. It seems to be able to eliminate the rambling of many online forums. One of the best web-based applications I have seen. bubbl.us is a web based program for brainstorming. TheBrain Technologies Corp. An animated interface to documents for Windows, Mac, and Linux. There is a free version. Plumb Design's Visual Thesaurus A fun way to learn the relationships and meanings of words. Not yet created, but described in the book (a must read). A beautiful vision of how powerful a tool software can be for creativity and understanding. Implementation of some of it's features were available in Scopeware (Windows only), which is sadly no longer available. Hypertext program for Mac and Windows (Amiga version available by request). Has outline processing, see-thru links (transclusions), easy creation of links, loads portions of documents, multiple windows, all documents can be scrolled (unlike many hypertext programs), support for some HTML export, handles very large documents and large numbers of links well, any word can be a link, some collaborative capabilities, can create many web pages from one document, some database capabilities, Amiga version is programmable using ARexx. Limitations include: does not separate format from content, doesn't support versioning, limited Internet support. However, it has the wonderful quality of now being usable (for even very large documents). Best of all, everything is editable, all the time. I formatted the Bible for it. It's free. The next line uses a see-thru link to clone a line at the bottom of this page. (website)This website was created and is maintained using Thinker. Email me if you want me to send you the Thinker files for this site. A drawing program for visually mapping ideas (Mac OSX only). 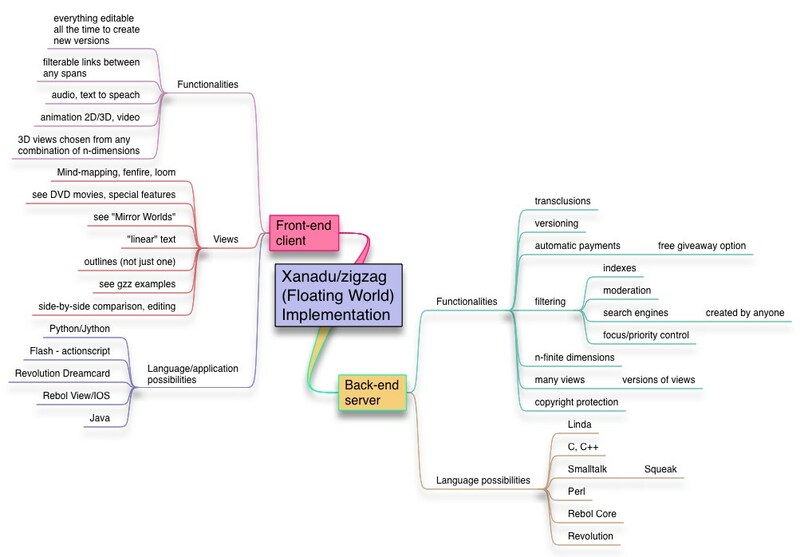 Samples: Xanadu implementation, and Communication Floating World databases. 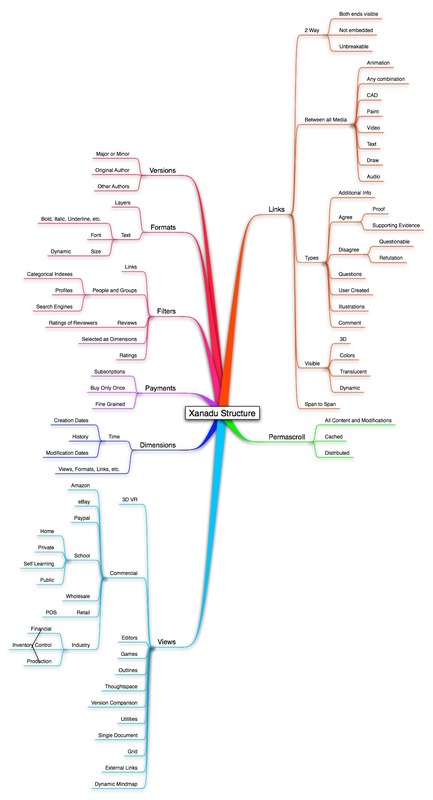 Similar to NovaMind Mind Map (Windows). 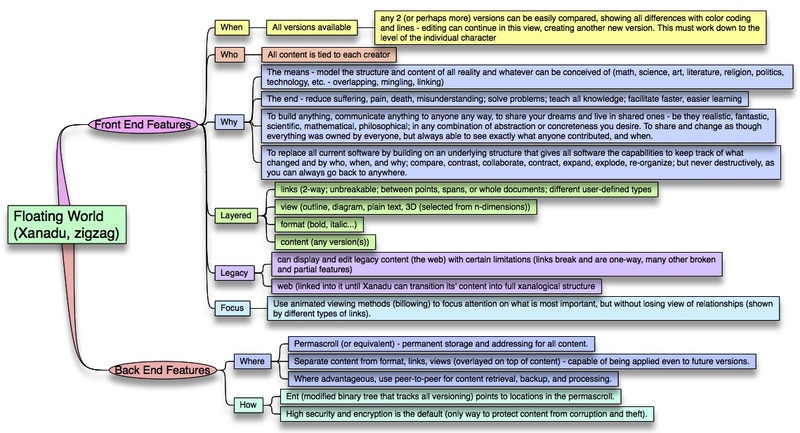 Inspiration is a mindmapping program for Palm, Windows, or Mac. Windows only. Nearly invisible interface; you don't have to save, think of filenames, or create folders. Searching is as simple as it gets. Lets you focus on content, not a complicated interface. An interface to Xanadu could be as simple as this, as complicated as audio/video editing or animation software, or anything in between. As Einstein said "Make everything as simple as possible, but not simpler." Hog Bay Notebook Similar to NoteLens, but for Mac OSX. Has many extra features, such as images, links, program links, plays movies, highlighting, font control, and more. I also formatted the Bible for it. Also free It has been replaced by Mori. Thoughtstream An interesting hypertext program for Palm handhelds with several types of links. Ezedia has some very easy to use Quicktime authoring tools. Amaya is a cross-platform web browser that actually allows you to edit and annotate any page and save it to your hard drive. Webstractor A combination web browser and editor for Mac OSX. Devon Technologies - Several innovative programs for Mac OSX. Worth reading about even if you use another OS. DEVONthink makes Google's search interface seem primative in comparison. SubEthaEdit is a Mac OSX collaborative text editor that several people can use at the same time on a network or the Internet. Much better than merely chatting, as you can type anywhere on the screen. Text is color-coded to reveal the author. Several changes were made to this document as a result of using it with collaborators. Google Docs and Spreadsheets is a web-based collaborative editing application. OmniGraffle and OmniOutliner Mac OSX only. Several of my recent documents have been created with OmniGraffle, a very flexible free-form mind-mapper that can output an entire website of linked image maps from one document. Incubator A flexible mindmapping and writing tool for Macs. Z-Write A Mac word processor for writers. WriteRoom (Mac) and Dark Room (Windows), distraction free writing in full screen. I wish that all programs had the option to hide everything but the content when desired. 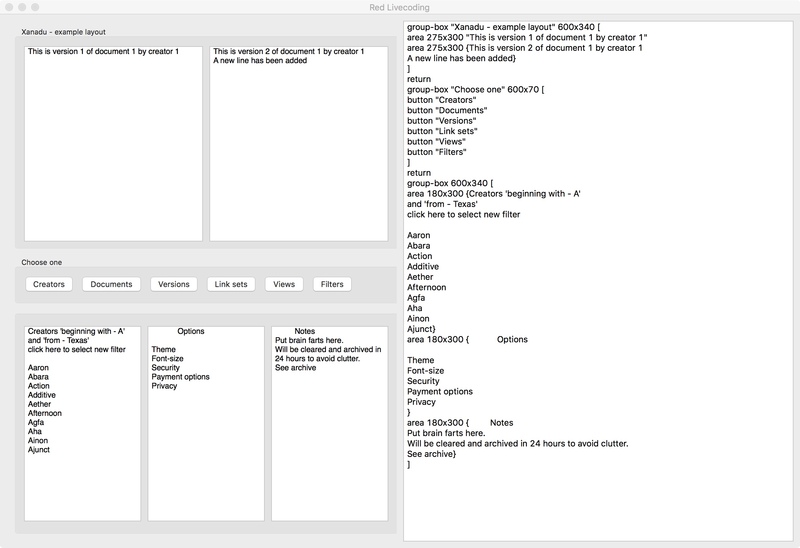 Tinderbox is a mindmapper, outliner, database, web design and writer's tool for Mac OSX. It has many ways of viewing the same information. Something like this would make a great front-end to Xanadu. The InfoVis Toolkit is a Interactive Graphics Toolkit written in Java to ease the development of Information Visualization applications and components. McNucle Data search and management tools (still in early beta stage). Server runs on Mac, can be accessed by Macs and Windows. So far, it's very buggy; hopefully it can be fixed. ZBrush is a combination 2D and 3D graphics program that redefines the meaning of computer graphics, blurring the lines between the number of dimensions being used at one time. Continuum - low-gravity floating and bouncing on platforms, reminds me of using gzz. It was available on Amiga OS 1.3 and MS-DOS. My favorite game on any personal computer. Tranquility - a newer game similar to Continuum (but more floating and less bouncing), demo version downloadable, highly addictive. Hyperland - 1990 Douglas Adams documentary about the web before it was really there. Memento - very intelligent script, check out the special features on the DVD. Hypertext helps us in remembering and associating. That is what this movie is about. Nice ambient music, too. Pieces of April - The featurette has a nice grid browsing look showing movement between animated video segments. Xanadu music by Olivia Newton-John on the iTunes store. On my OSX system with Safari, this link works if iTunes is already running. G-force music visualizer. Can we make software interfaces that look like this? So beautiful it's scary. Revolution An easy to learn graphical language that is very cross-platform. Good Internet and multi-media support. tk3 Not programmable like Revolution, but good for publishing books. NoteTaker Mac OSX only - personal organizer. Has scrolling windows, outlines, can record audio notes and include video. Altme - Built from Rebol View. A private chat, file sharing, calender, check-list - collaborative system that is peer-to-peer. Windows, Linux and Mac OSX. This shows the power of the Rebol language. See altme below. Curl is similar to Rebol in many ways. Squeak - cross-platform Smalltalk. May be used in a future version of Abora . Python - open-source, cross-platform. Easy to learn, but suitable for large projects. Is being used for some Xanadu programming. At this time, it seems the most likely candidate for implementing Xanadu. It is, however, more difficult to install and upgrade than Rebol. Jython - used in the newest gzz. A Java implementation of Python. PyLinda Python version of the Linda language. A language for distributed computing. Flash has become a very versatile multimedia Internet language. It takes some time to learn, because it follows the syntax examples of C++ and Java. Flex is a programming environment that combines Flash (and it's ActionScript Language) and XML into an easy to learn system. It's not cheap, but is likely to become extremely popular for designing web pages. What I like best about it is how easy it is to create user-editable parts of programs. I wish all computer languages would implement that capability, since it seems so basic to me. Sheep - fast compiler, for the new Amiga, not cross-platform, but might be used for writing a front-end for Xanadu-like programs. Will be similar to ARexx and Applescript, a scripting language that can add capabilities to applications and exchange messages between them. Java - versatile, cross-platform, but difficult to learn. It hasn't lived up to all the hype that originally surrounded it, but is still important for many things. Alice - Very easy to learn 3D animation programming environment. Free, works on Windows or Mac OSX. Scratch Drag and drop programming for beginners. A painless way to begin that offers instant gratification for those frustrated by the huge first stages of most languages. EROS - Extremely Reliable Operating System (based on KeyKOS ) A bullet-proof system still in development. Viruses can run on it harmlessly. The future of operating systems must be like this. Agorics also has GuardOS. The successors to EROS are CAPROS and Coyotos. Tunes is a project to replace existing Operating Systems, Languages, and User Interfaces ... Here is a page they have listing many OS's. The best writing I have found anywhere about the history of operating systems is at Roughly Drafted. There is an emphasis on Apple; but other desktop, PDA, and phone OS's are covered in depth. Daniel Eran Dilger deserves a Pulitzer for his writing. I have searched for years for writing of this quality. How to make it all happen? What principles and precautions need to be kept in mind to make Xanadu and/or Mirror Worlds a reality. Xanadu has been a dream and on and off project since 1961. It could become a working reality by business, non-profit group, or a university: anyone willing to supply the creativity, discipline, and resources to make it happen. Good business books I have read that dramatically changed my thinking (actually I listened to the audiobooks many times). Some books are far better than average and deserve repeated readings. Getting Things Done: The Art of Stress-Free Productivity, by David Allen - If there is one book I wish I could have read when I was 10 years old, it is this one. I first read (listened to) this book in 2008. For the past several years, I had given up hope that effective management and organization was a possibility. I have now regained hope. The World Is Flat How the Internet and fiber-optic cables are changing the world's economy. Good to Great: Why Some Companies Make the Leap... and Others Don't, by Jim Collins - In-depth research project into top long-term performing organizations. Many surprising findings. The Millionaire Next Door, by Thomas J. Stanley and William D. Danko - Research showing that most millionaires got that way and stay that way through frugality and discipline. Lifestyles of the rich and not famous (only the abnormal and rare is newsworthy). The Goal: A Process of Ongoing Improvement -- by Eliyahu M. Goldratt, Jeff Cox - The logical mind of a philosopher applied to manufacturing. By David J. Anderson, Eli Schragenheim - Informit Informit Safari Online I just started reading this book, but it looks very promising. It applies Goldratt's theories (see above) to software project management. These books show that in the real world, reason, understanding of cause and effect, creativity, discipline, attention to customer needs, and persistence all pay off in the end. Dialogue Mapping: Building Shared Understanding of Wicked Problems The methods here have much in common with the goals of Xanadu: understanding complex problems and allowing for social diversity. Jim Wingard interview "It seems that the real challenge (as with most software projects) is defining exactly what the requirements are and how to build your beast. Once you've nailed down the "what and how" of your project the actual implementation doesn't take too long. Beyond that, there is always the matter of coordinating schedules with outside help." Recommended Training - I know, some of this teaches web design, but there will be a transition period, and the web will still be much used until the new software becomes mature. VTC - Thousands of movies teaching various software. $30 a month. Lynda.com - Similar to VTC, but specializing in web design and graphics. $25 a month. Informit - Excellent online source of programming books and videos. Wikipedia - Enormous collaborative project writing an encyclopedia. Will be excellent content source for more advanced Internet-based hypertext as it becomes available. Yourteacher Online video math courses. Mathfoundation Online math courses using Flash. Publisher's story "The secret to programming is having smart friends." xanadu.meetup.com Meet other Xanadu fans in the real world. Frappr group See where all the Xanadu fans live (on a Google map). This website was created and is maintained using Thinker. Email me if you want me to send you the Thinker files for this site. Xanadu and ZigZag are trademarks and patents of Ted Nelson.